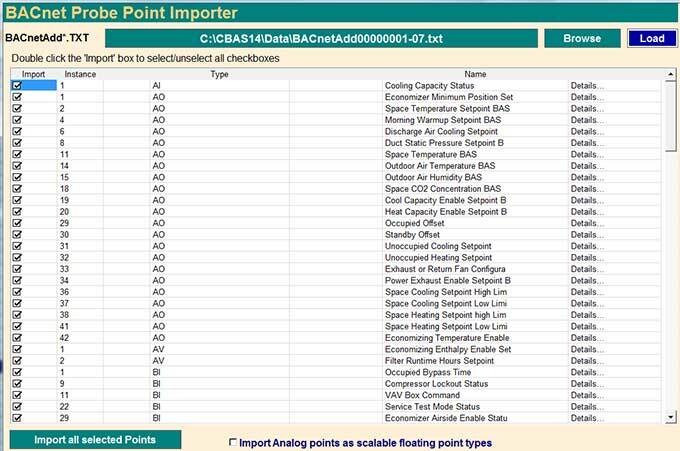 Did you know that you can “probe” a BACnet device to get all of its settings, capabilities, and available points, then import everything, including points, into CBAS? To do a Probe, of course, you have to have a 485 or IP connection to the device, like a VFD. Once you have added the channel to the Host controller and added a Generic BACnet Controller to the channel, make sure it has downloaded to the Host Controller by erasing the database from it. When you start CBAS in Real Mode, the Host Controller will download and then turn to Normal. Within a minute, the BACnet Channel will begin working and as long as the 485 address and baud rate are correct, the device will come up Normal for about 60 seconds. While it is Normal, click the Generic controller and go to Program. Click the Probe button at the bottom right and the Probe will start polling the device. This could take a few minutes. When complete, it will tell you where the file was saved. If you attempt to Probe while the device is Lost, the Probe will fail. An example of a partial Probe file can be found at the end of this article. The most important thing you can get from the file, other than the points list, is the Instance number. Copy this number and proceed to the Program screen again then paste the number in the field labeled Inst. Having the Instance will make the initial communication to the device happen much faster each time CBAS is started by skipping some of the initialization packets that go back and forth. The next section of the file shows Supported Services. CBAS will support COV (Change of Value) and Read Property Multiple (RPM). When you Probe the device, these services will be enabled in CBAS. COV is a service that allows the device to send value changes of points whenever they change instead of having to be polled. Read Multiple and Write Multiple are also nice to have and will cut down on network traffic by reading and writing multiple points with contiguous addresses in one packet instead of individually. This is how you set it up in CBAS. If you Probe a BACnet device, it saves all the services that the device supports in the CBAS database. If the panel says that it supports RPM then CBAS will use RPM to read the points. If it says that it supports COV then CBAS will also register for COV changes for every point in that BACnet controller. But there is also a User Override for these settings in the ‘BACnet Settings’ dialog which is found just above the Probe button. If you make changes to the Supported Services in BACnet Settings then these settings will override the Probe settings. So if you have a device that was probed and it says that it supports COV, but you don’t want CBAS to use COV, then override it in the BACnet Settings dialog. Just double-click the Yes or No at the right column to change it, then restart CBAS. If you do not do a Probe and have not done anything with the User Overrides then CBAS will default to NOT using RPM or COV. Recap: If you click anything in BACnet Settings then CBAS will use whatever you click. If you did not make any User Overrides then CBAS will use Probe data. 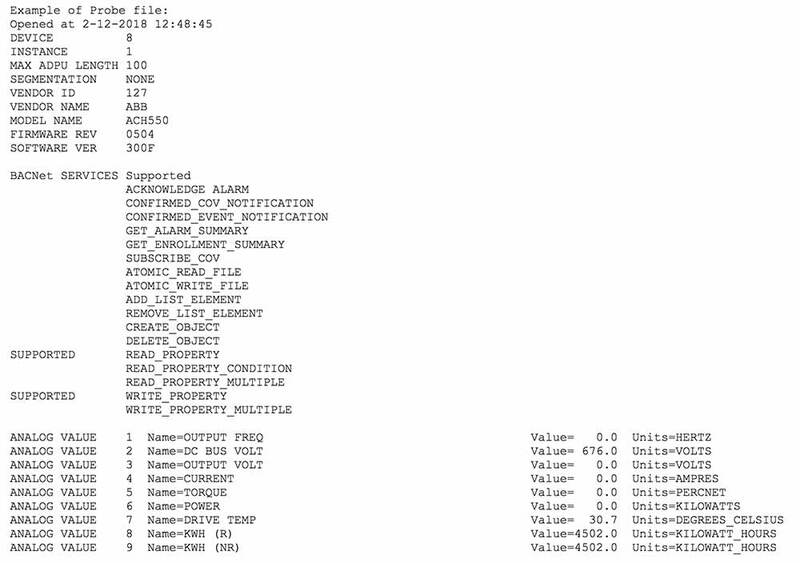 If you have not done a probe then CBAS will default to using the Single Read Property command. Click the Browse button and locate/select your Probe file then click Load. You will see a list of points. Uncheck the points you don’t want to import. If you decide later that you need a point that wasn’t imported, you can always go back and do it again and only select certain points. Some devices have many points that are not needed and polling all of those points can cause unneeded traffic which will slow down the changing of statuses. Of course, you can import them all and then later delete the ones you don’t want under Database, Remove Points. Click the “Import all Selected Points” button in the bottom left. If you find out later that you need Analog points (AI, AO, AV) to be Floats, then select the Analog points and click the button in the middle “Import Analog Points as Scalable Floating Point Types”.